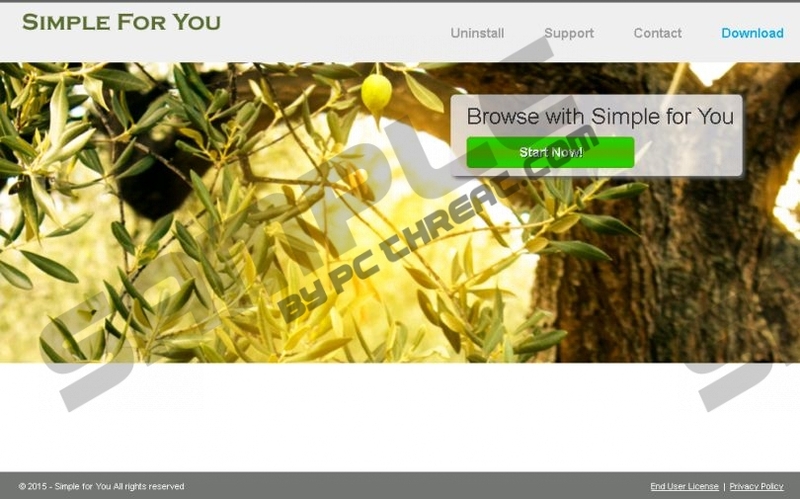 Simple for You is an adware application that can gain access to your system if you are not careful enough when you are downloading software from the Internet. We advise that you remove this application because it spreads the same way other suspicious or potentially unwanted programs do – via software bundles. If you do not want to waste your time trying to locate and terminate programs that are infecting your computer, resist downloading freeware or shareware from unreliable Internet sources. It is not only the distribution that makes experiences computer users avoid Simple for You. No matter what the official site simpleforyousoftware.com might promise, this application does nothing that you can find useful during your daily computer activities. The only thing it is actually good at is annoying you with the third-party content, which might manifest itself as pop-ups, banners, or other forms of advertising. If you are not a shopper, and would prefer to keep your screen clean from all the coupon and discount info, you should remove Simple for You the moment you notice “Ads by Simple for You” or “Provided by Simple for You” on your browser. The third-party content this application promotes might not always be secure; therefore, you should avoid clicking on the ads, because they might unexpectedly reroute you to unsafe content. Simple for You also tracks your Internet surfing patterns for advertising and marketing-related proposes; as this application does not inspire much confidence, we recommend that you terminate this activity by removing Simple for You from your machine. Simple for You belongs to a group of Superweb applications, a fact which suggests that you should delete this app as soon as it enters your machine. Simple for You is a clone to other applications developed by SuperWeb LLC, a few examples being Dollar Dream, Metal Maker, Fruit Basket, etc. If you run into any of these applications in the future, remember that they are identical to Simple for You. As all these applications are infamous for being the cause of the security issues, users are generally advised to remove the apps from computers. Thankfully, it is not that complicated to delete Simple for You from your machine. However, bear in mind that this application can leave tracking cookies or other “leftovers” that might remain active after the removal process. If you want to guarantee that all malicious content is terminated simultaneously, install an automatic malware removal program. If you keep this software active on your machine, you will not need to worry about the threats that might harm your computer. Open the Charm bar and click on Settings in the list. Under View by, select Small Icons, and click Programs and Features. Find and select Simple for You in the program list. Under View by, select Small Icons. Open Programs and Features and choose Simple for You in the list. Click on the Start button go to Control Panel. Go to Add or Remove Programs and choose Simple for You in the list. Quick & tested solution for Simple for You removal.